I have implemented syntax highlighting in RapCAD using the same lexical analysis engine as the script parser and evaluator uses. I wanted to do this for two reasons, firstly flex is comparatively faster than the example QT SyntaxHighlighter implementation which uses QRegExp’s. This is partly because the lexer is built at compile time, where as QRegExp’s are compiled at runtime. The second reason for using flex as the backend to the highlighter was to ensure that there are no ambiguities between the syntax highlighter and the language definition. 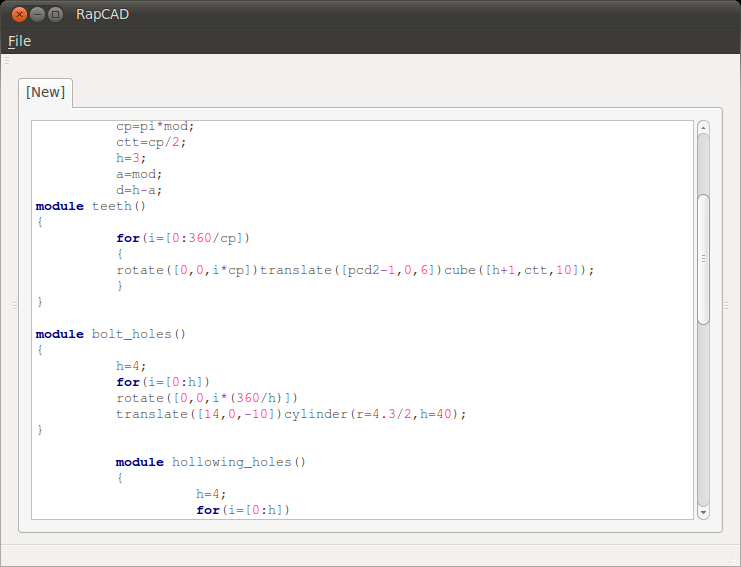 I have also started to look at how to make the scripts output 3D shapes using CGAL. Its certainly not a trivial task, but I am starting to understand things.